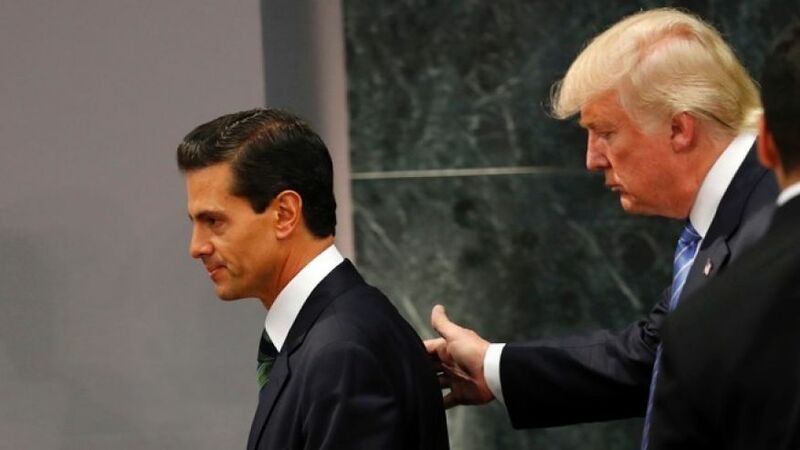 Mexico City – The morning after the citizens of the United States elected Republican Donald Trump as the country’s 45th president, elected officials and others in the corridors of power in Mexico scrambled to get a hold of the situation. Mexican President Enrique Peña Nieto, who publicly vowed that his country would never pay for the border wall that Trump made a centerpiece of his presidential campaign, tweeted a series of messages about Trump's victory. The U.S. is Mexico's largest trade partner, and Trump has threatened to rescind the North American Free Trade Agreement. "The relationship of Mexico and the U.S. is uncertain," Isidro Morales, of the Monterrey Institute of Technology and Higher Education, told the Associated Press. "Donald Trump is not a person of institutions. Surely it will be a unilateral policy worse than [George W.] Bush and we don't know what to expect." On Wednesday morning, before the Bolsa, Mexico’s stock market, opened, the country’s Finance Minister, José Antonio Meade Kuribreña, and the head of the Bank of Mexico, Agustín Carstens, issued a joint statement asking for calm in the financial markets. Nevertheless, the equivalent of the Dow Jones index in the Bolsa, the IPC, dropped 1,900 points in a few minutes after trading began. Mexico's currency appeared to track Trump's rising and falling fortunesthroughout the campaign, and it fell sharply Tuesday night. According to Banco Base, the peso dropped 9.56 percent, its biggest daily loss since 1995. "I think we have to be calm," Jorge Castillo, a Tijuana-based economist who works at the College of the Northern Border, told Fox News Latino. "We can't paint too dark a picture. We know there are checks and balances. There's too much business between Mexico and the U.S."
He believes that the federal government will have to take at least some emergency measures. "[Banco de Mexico] will have to intervene," he said. "But it's a short term situation. The best way to help the peso is to have a strong economy, to develop, to have trade flows." The currency on Wednesday seemed to be stabilizing without any extraordinary actions having been taken. Eduardo Martinez, a financial advisor in Mexico City, told FNL, “The weakening peso is a gut reaction from the markets, but we are the U.S.'s biggest trading partner, and that isn't likely to change." "[Trump's] campaign caused instability, but it was a campaign," Jorge Heriberto, an economist based in Guadalajara, told FNL. "In practice, it will be different. I don't think he will be as radical." "The market has calmed down a bit and given the benefit of doubt to a more conciliatory Trump," Marco Oviedo, an economist at Barclays in Mexico City, told Reuters. That sense of hope extends all the way down to the street level. International ratings agency Fitch has indicated that it may add risk to its economic forecast for Mexico. "Very hard times are coming to Mexico," analyst Gabriela Siller of Banco Basetold Reuters. Across the country, people were scratching their heads in wonder at the results of the election. “It’s a very confusing time, knowing that our neighbors across the border in Texas chose a candidate who has spoken so hatefully about us, particularly of the situation on the border in cities like ours,” Patricia Ortiz, a spokesperson for the mayor’s office in Reynosa, across the border from McAllen. For Ortiz, it isn’t Trump’s border wall that worries her, it’s some of his other hardline immigration proposals, like the immediate deportation of millions of undocumented immigrants in the U.S., many of whom are of Mexican origin. “The Americans have already built two very large walls separating us from Texas,” Ortiz said. “What concerns us are his plans to send undocumented migrants and workers back here, as these people can create very bad problems for the Mexican border cities in places where drugs and crime are a problem.